Dan (Mark Ruffalo) and his partner, Saul (Mos Def) run an independent record label. After Dan had failed to find and sign any profitable performers for some time, Saul fires him. Dan’s life goes into a downward spiral. He lives apart from his estranged wife, Miriam (Catherine Keener), and his teenage daughter, Violet (Hailee Steinfeld), wants little to do with him. Consequently, he spends most of his time drinking. While at a bar one night, Dan happens to hear Gretta (Keira Knightley) perform a song she had written. As he imagines what her song could be with the proper arrangement, he decides he must sign her. She could be the ticket to getting his job back and Dan redeeming himself. Gretta, who had recently been dumped by her now famous boyfriend, Dave (Adam Levine), reluctantly accepts Dan’s offer. His idea is to record Gretta performing outdoors all over New York with musicians he has collected. The ambient noise will provide a backdrop for all the songs and the album will serve as an homage to the city. Saul is hesitant, but decides to give Dan one last chance. As Dan and Gretta spend time together, they get close. Gretta befriends Violet and helps Dan connect with her in ways he didn’t know how to previously. Mark Ruffalo and Keira Knightley perform well in this feel good movie. The story itself is mostly predictable, and goes pretty much how you would expect in this not quite romantic drama. The film centers more around relationships between family and the integrity of artists. What stands out most about Begin Again would be the soundtrack. The idea of an album recorded in various locations, including the people and background one would expect in NYC is interesting. And the way it is presented in the film really could work. Surprisingly, Keira Knightley does a pretty good job lip syncing along with the lyrics. I don’t think I’m the target audience for this film. It definitely comes across as a “chick flick.” Even with the occasional odd scene, like where Dan, in a drunken stupor, imagines the instruments around Gretta playing the arrangement in his mind, it is a decently done film. 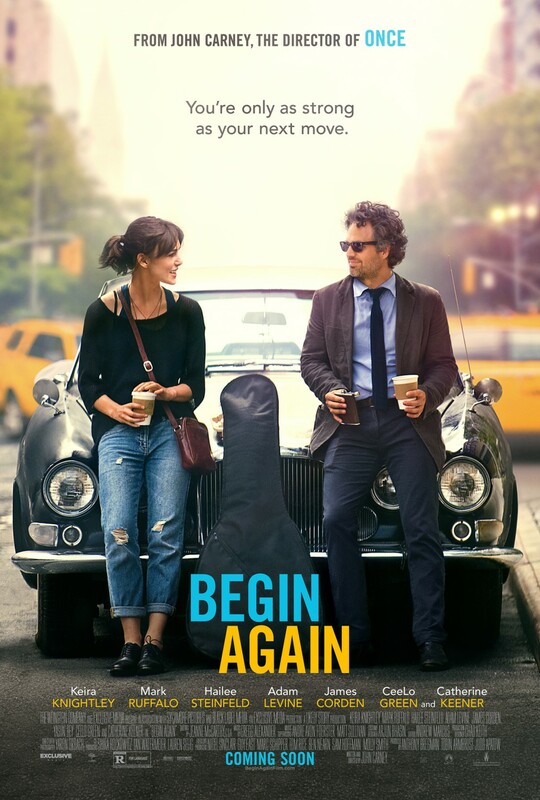 Begin Again is a good enough movie, if you’re looking to fill some time. It isn’t ground breaking or life changing, but it’s not a bad pick if you’re headed to the RedBox. Side note: When the bartender punches Mark Ruffalo for trying to run from the bar for not paying his tab, I was secretly hoping he was going to turn into the green guy. Knightley actually does all her own singing in this.